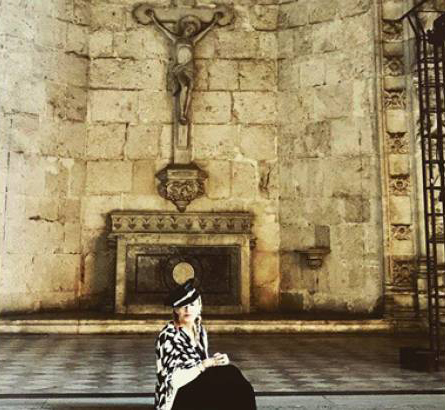 Pop queen Madonna has been visiting Portugal with at least three of her adopted children, and is apparently keen to buy a property in Sintra. According to SIC television, her quest began in Lisbon but moved swiftly westwards towards the beguiling Sintra hills where she may have found just what she is looking for: an €18 million 42-hectare property in Colares that produces its own wine. Quinta do Vinagre. On the market for at least two years (in 2015, Expresso put the asking price at €17.5 million) it is being sold by a “famous French family” (see below) with the very un-French name of Schlumberger that apparently made its fortune in oil. Expresso says the 16th century ‘quinta’ has been the stage for some “exceptional parties” with VIP guests of the past including actresses Gina Lollobrigida, Audrey Hepburn and the Duke and Duchess of Windsor. Madonna was apparently accompanied on her round of house-hunting by officials from Sintra council after being seen visiting Lisbon’s French lycée, to put her older adopted son’s name down. David (Banda) meantime, adopted from Malawi five years ago, was training with Benfica’s under-12s in Seixal while his famous mother was enjoying holiday moments on the beaches of Comporta and sightseeing in the capital with his younger ‘sisters’. NB A back issue of Diário de Notícias suggests that the Schlumberger’s may not be French after all. Pierre Schlumberger was described in a report from 1968 as being American, with a wife – Maria da Conceição – who was Portuguese. According to the same report, the grounds of the quinta at the time had sculptures by Henry Moore and Picasso. It is not clear whether those remain in place today.